HVAC technicians regularly use extension cords on the job site. The extension cord must be selected carefully because it is one of the most-used pieces of equipment in an HVAC technician’s collection. Outdoor extension cords must be industrial grade and able to carry the heavy electrical load required to power tools such as drills and sawzalls. We have found the best extension cords available for purchase in 2017, and we have a list of tips to consider when selecting the extension cord for your work needs. It is important to have the right kind of extension cords on the HVAC job site because the cord is responsible for carrying the heavy duty electrical load. Instead of being hooked directly to the power source, the extension cord is an extension of the electrical wiring of the residence or industrial location. The HVAC technician’s extension cord must be able to withstand the wear and tear of repeated use day in and day out. The extension cord will be dragged across a variety of terrain, up and down the stairs, around corners and everywhere on the job site. This is a piece of equipment that will be used often. A durable cord is a necessity so that you will not be replacing it often. In addition, ordinary household wiring will not handle the power load without tripping a breaker, and the job won’t get done without the correct extension cord. You should choose a cord that is at least 50 feet long because it will reach into the attic or beneath the home. The 50-foot length will also allow you to set up your sawhorse and sheet metal a safe distance away from the home and bystanders. The regular size indoor extension cords are not suitable for powering anything more than a lamp or a fan because if the cord is not thick enough nor long enough, the cord will overheat and melt down. It can cause a fire and a disaster. The industrial heavy duty extension cords can carry the heavier electrical load without melting down and causing extensive problems for both the homeowner and the HVAC tech. HVAC technicians regularly use power tools that are high in amps, and to safely operate it, HVAC technicians need to use an extension cord with a lower gauge number of conductive wire. The longer the power cord, the thicker the wires and the lower the gauge number of wire required. We have found the best selection of extension cords available in 2017. US Wire 74050 is one of our favorites. The AmazonBasics 16/3 is an extension cord that lives up to its name. It is a basic durable cord that can easily handle a power load. The Watt’s Wire 10/3 is another wise choice for the HVAC technician. It is rated high enough to carry even the heaviest power load. The blue US Wire 98050 is a good choice for the technician who works on furnaces during the winter months. 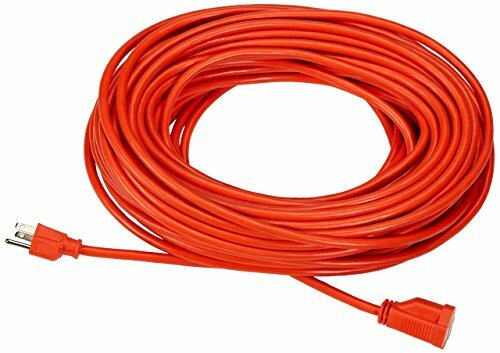 The AmazonBasics 16/3 Vinyl Outdoor Extension Cord is 100 feet long. This 16-gauge cord is durable and is a good choice. It will trail you across the job site for years to come. This extension cord comes highly recommended because it has a three-prong connector for grounding. This helps prevent accidental electrocution. This particular extension cord has a bright orange jacket so that it is highly visible on the job site. This will prevent it from getting in the way of a saw or causing trips and falls on the job site. You can’t go wrong with this lightweight extension cord that coils quickly so that you can easily transport it from one job site to another. 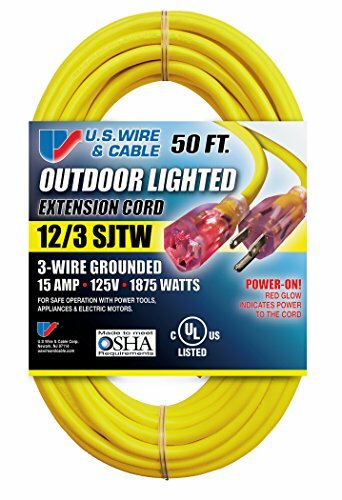 U.S. Wire 74050 is a 12/3 yellow, heavy-duty extension cord with a lighted plug. It is 50 feet long and is rated to carry an industrial power load. This safety conscious extension cord features a power indicator light so that you know when it is a live wire. This is an American made product. It is durable and with its bright yellow jacket and power light, you will be able to find it in the dark areas of a crawlspace under a home or in the attic. Overall, this is one of our favorite cords for HVAC technicians to have in their work truck. It is long enough to get the job done, but not too long to be a nuisance on the job site. Longer cords tend to tangle or get in the way when you are working. We recommend that you have a couple of these on hand because if you need the extra length, you can hook them together with ease. This extension cord can easily handle the power of a sawzall or a corded drill. 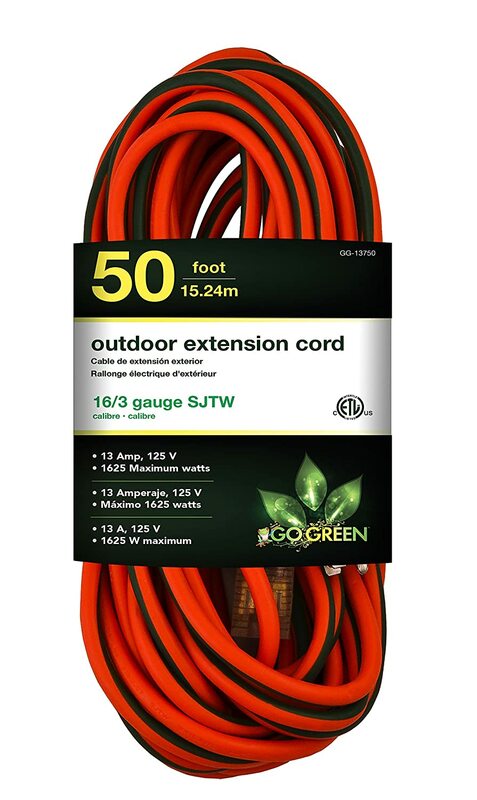 This GoGreen-Power-GG-13750 extension cord is another 50-foot cord, but it is not as heavy duty as the US Wire 74050. It is a higher gauge wire of 16/3. It is similar to the US Wire in that it has a lighted end for safety. This extension cord boasts its ability to resist moisture, sunlight, and abrasions. This power cord is thick and durable. It has a very bright orange jacket that helps it be seen on the job site. We have found several reports of issues with the grounding prong. It is made of plastic and easily breaks. This would be of great concern to HVAC technicians. Therefore, you would want to use this extension cord with great care on the job site to prevent electrocution, sparks, or a fire. The US Wire 98050 is a heavy duty cord. It is a 14/3 and 50 feet long. This cord is highlighted by its blue color and its ability to withstand cold weather. It also features a lighted plug to verify that the cord is operational. This cord is one of the most flexible on the market because it is made of a durable thermo-plastic elastometer compound. HVAC technicians work in frigid conditions when heaters and furnaces break down. 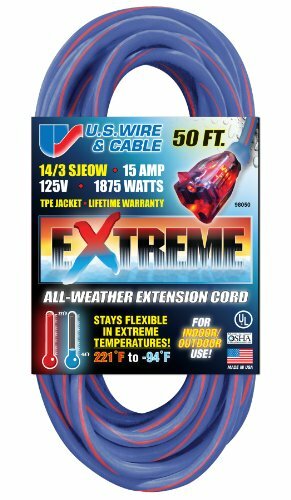 This cord can withstand the extreme weather conditions that HVAC technicians regularly work in. It is a tangle-free cord and is lightweight. This cord won’t scuff the linoleum or a hardwood floor if it is taken inside for use by an HVAC technician who is handling a problem. Our main complaint is that the jacket is blue and not the typical orange that can easily be seen and recognized on a job site as a live wire. 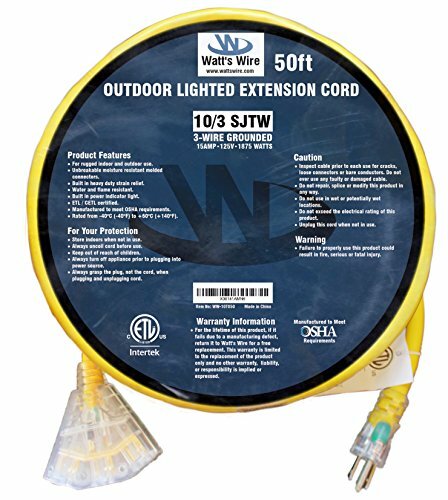 Watt’s Wire 10/3 extension cord is heavy duty and 50 feet long. It is safe for use both indoor and outdoor. It is able to carry the heaviest of electrical current loads without a problem. If you are looking for the cord to handle the most amps, this cord is the best of the bunch. It can easily carry the 15 amp current. The cord features a double jacket. It is not abrasive and won’t scratch any surfaces. An HVAC technician would be wise to have one of these cords in the work truck for regular use. This yellow cord can be easily seen in low light, and this safety feature is important to the HVAC technician who is working in dimly lit attics and crawlspaces. Choosing an extension cord seems like an easy task, but it should not be taken lightly. The extension cord is one of the most important pieces of equipment used by an HVAC technician. It keeps all of the other tools running. A durable extension cord will serve the HVAC technician for years to come without meltdowns, tangles, or short circuits. A well-chosen extension cord will trail along behind the technician from place to place at each job site to get the job done.